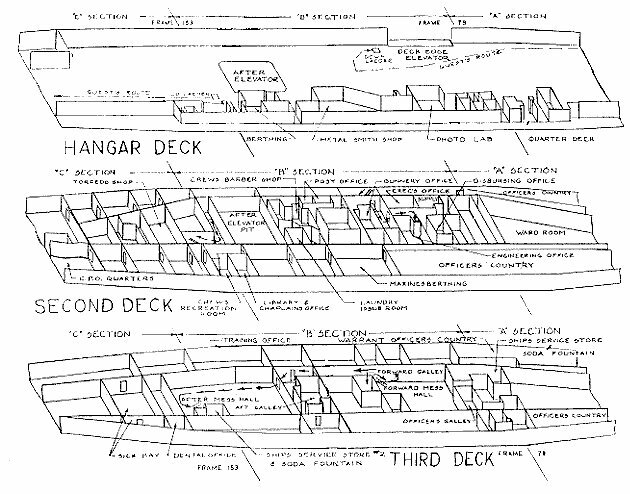 embarked aircraft squadrons and detachments. Length (extreme) -------- 898 ft. Breadth (extreme) ------- 151 ft. Draft (full load) ------- 29 ft. Flight Deck Length ------ 190 ft.
worthy traditions by her illustrious predecessors. hazardous duty of guarding the Delaware Capes in 1777.
the 'Penguin', and escaped capture by the Cornwallis'. dispatch vessel between 1813 and 1820.
life of one year and five days proved a glorious one. Luzon and Formosa attacks, she served as a troop transport. fleet of the United States Navy. GROUP ASSEMBLY #3: Aft Galley Stb. Side: Air Department. Mess line will form as directed by the MAA force. nated first class P.0. mess. Watchstanders will eat early at Group Assembly #3. LAUNDRY - There will be once a week service for all hands. are available for daily service. for these services and no tipping is allowed. and rubber heels must purchased ships store. 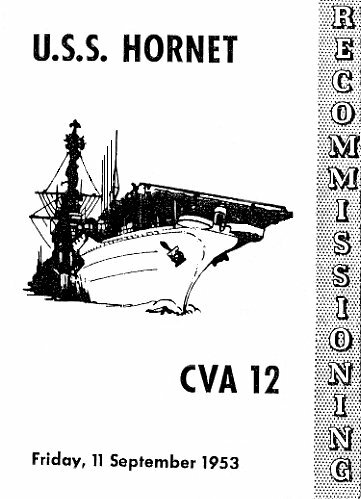 and from 1800 to 1900.
the approval of the Commanding Officer. tablished. In port, local facilities must be used. made over the ship's loud speaker system. athletics will be provided by the Athletic Gear Locker. Aft, and these are designated A, B, and C, respectively. tions; Frame l53 between the B and C sections. The decks. and the L indicates it is used as a living space. 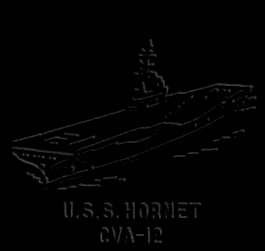 the life of the Hornet to continue. 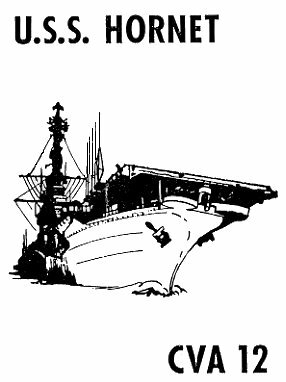 BUILT BY - Newport News Shipbuilding and Drydock Co.